Last week when people around the world celebrated #GreekDinner via Twitter, I thought about my Byzantine princess from the 12th century. She grew up in the great palace in Constantinople, and there was a banquet room there called the Hall of the 19 couches. 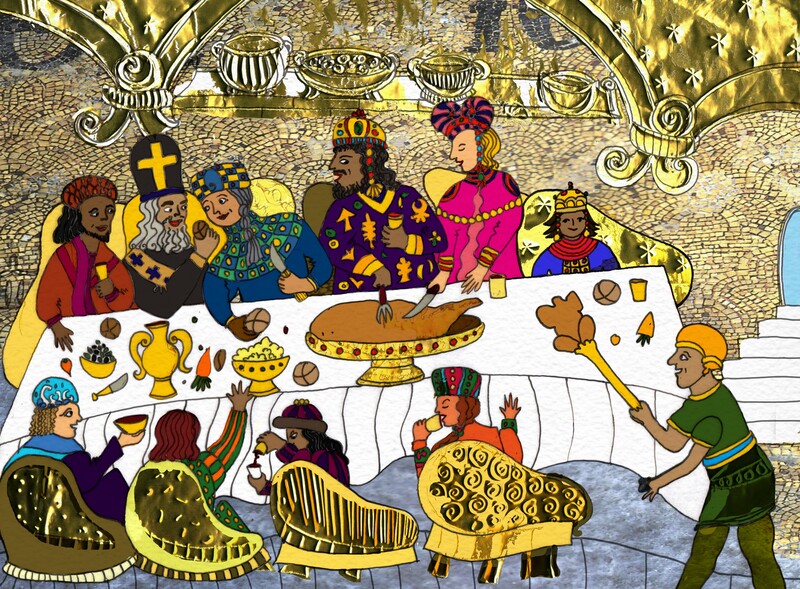 I don’t know exactly what it looked like except that everyone ate in the old Roman style, semi-reclined on a couch and that the dishes & platters were solid gold. They were so heavy that servants had to lower them to the table from above. Thanks so much for your comment. I hope I can use it when I rewrite the whole story. Hope you have a good weekend! I LOVE the gold mixed in. The confidence of your decorative linework brings the whole thing together. Plus, it looks like a wonderful party! This looks cool, Annina! I am enjoying imagining platters of gold being lifted in! Wonderful story, Annina! And your illustrations? Amazing, vibrant, detailed, feeding the imagination. Bravo!!!! Wonderful and so much detail Annina.